On the afternoon of November 3, the Girls Talking Circle collaborated with Community Health and Youth Services staff to make no-sew fleece blankets for various groups in the community. These blankets were personalized with all the great fleece patterns and colors available in what turned out to be a quick and easy project that benefited everyone involved. 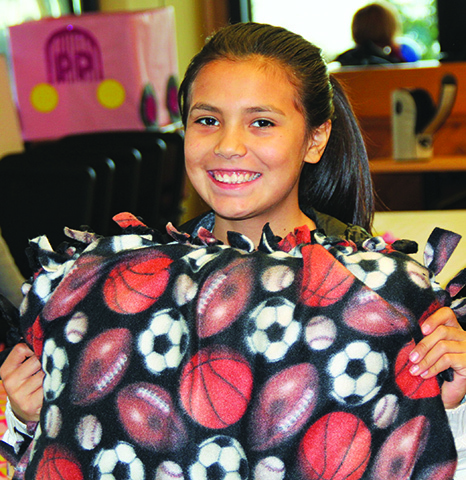 “Each girl had an opportunity to choose whether they wanted to make a blanket for an infant or elder in our community,” explained event coordinator and para-pro, Monica Holmes. 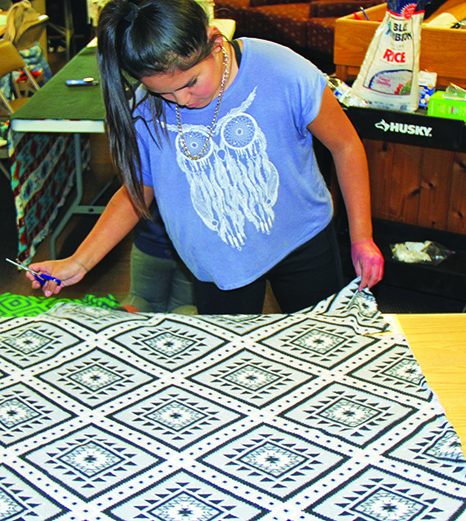 “The girls were given a packet with detailed instructions, selected their desired fabrics for the blankets front and back, then used math skills and hand-eye coordination to measure and cut the fabric to the desired size. After that they carefully tied the fabric together into a blanket. Anna Foldesi from the Early Learning Academy helped support the blanket making event by bringing in extra supplies and fleece fabric, plus donating several pre-made and partially made blankets. Anna moonlights as a weekend seamstress and used her expertise to provide additional guidance to the youth as the event went along. Cierra Shay of Youth Services and Heather Duncan also volunteered their time to assist the girls complete as many blankets and individual projects as possible. 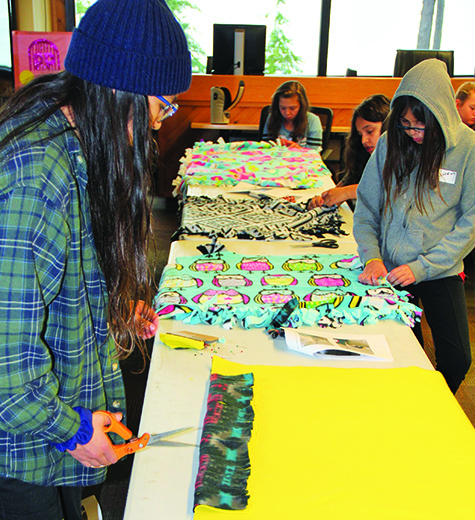 In the Tulalip spirit of making one to giveaway and one to keep, the youth and volunteers made either a baby blanket to gift to a community infant or a lap blanket to gift to an elder. Taking the craft making one step further, some of the girls added bags of rice to the inside of a blanket to create a weighted lap pad for specials needs children. For these children, the deep pressure offered by a weighted lap pad can provide emotional and nervous system regulation. 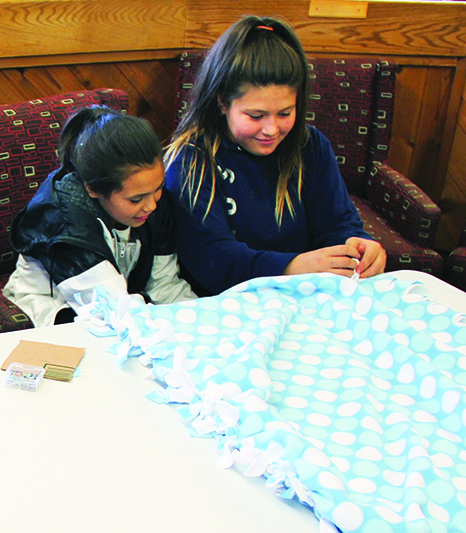 During the two-hour event, the Girls Talking Circle worked together to tie blankets for a great cause, socialized, and witnessed how a couple hours of hard work can make a big difference. The Girls Talking Circle is hosted at the Tulalip Teen Center every Friday from 2pm-4pm. Most of their activities occur on-site, with the occasional field trip taking them off Reservation for new experiences. Additionally, Girls Talking Circle gives participants an opportunity to talk about real life issues and work through solutions together in group, with a trained, professional adult moderator in Monica Holmes. Please contact Monica at 360-631-3406 or mholmes@tulaliptribes-nsn.gov for more information. This entry was posted in Local News, News, Tulalip News and tagged Girls Group, Tulalip by Kim Kalliber. Bookmark the permalink.